Fred Schlomka, founder of Green Olive Collective, prepares for a long distance ride through the U.S.
Fred Schlomka is idiosyncratic enough that I shouldn’t have been surprised when our interview by email, between the U.S. and Israel, morphed into a personal meeting in Minneapolis. 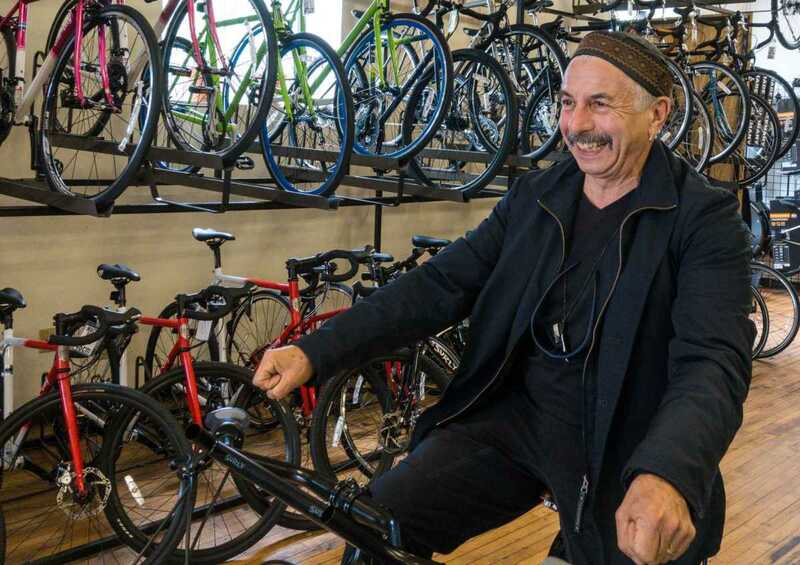 And even less surprising, now that I think about it, was that we met at a bike shop, The Hub in Dinkytown to be precise, a favorite retailer we share. Based on some really good advice, Tom and I sought out Green Olive Tours, the company founded by Schlomka, when we were in Israel more than two years ago. Our day-long guided itinerary took us to Masada, the West Bank, Jericho, a Palestinian village and an Israeli settlement…driving across several checkpoints, up into the hills on sleek new settlement highways and across bumpy roads through Bedouin and Palestinian lands. More on this eye-opening tour below. I knew I wanted to meet the founder of Green Olive, impressed as we were by their cross-boundary itineraries. But at the time, Schlomka and his wife were biking around Europe and Turkey (a tour of about 4,000 kilometers), just another reason we wanted to meet and talk! At The Hub, Fred checked out a couple different handle bar solutions for the new bike he was about to ride around various parts of the U.S. Once we settled in over lunch, he gave me some family background and explained why he was in Minnesota. Many generations of Schlomka’s mother’s family came from Jaffa; his father was born in Germany. After some time in Israel, the couple moved to Scotland where Fred was born and raised. But through his adult life, Fred returned to Israel often, and eventually moved there in 2000. His unorthodox education and career path also included some 20 years in the U.S. Schlomka developed the American Caribbean Builders, which worked with FEMA in Florida after Hurricane Andrew, built a handyman service which has since been franchised, and, on the side, started up a music publishing business. (His wife Sunita, from Minnesota, is an internationally renowned folk harpist, so their travels frequently coordinate with her concert tours and music conferences.) Fred’s experience with social justice evolved when he was the first Executive Director of Mosaic Communities, launched via his Echoing Greens Fellowship in 2003. In Israel, he managed the Israeli Committee Against House Demolitions. He’s an organic gardener. And, as a second degree black belt karate student, he’s also a karate teacher, proudly combining Arabs and Jews in the classroom. So you get the picture. Fred is a go-getter and fascinating, direct and high energy. He established Green Olive Tours in 2007 and became CEO of the Green Olive Collective in 2013. The collective, a membership organization self-described as a social enterprise and workers collective, is led by a team of nine Israelis and Palestinians. But from a tourist’s standpoint, it is a unique opportunity to visit both sides of Israeli-Palestinian territories and to gain new perspective on the current state of affairs. From the stark mountain of Masada, looking east across the Dead Sea to Jordan. Masada Mountaintop Fortress – The site famous for the decision by a small tribe of Jews to commit suicide rather than be taken by Romans in the 1st Century. Yes, ancient history, but important when you consider this place is central to Israeli education even today, visited by schoolchildren and all armed forces. 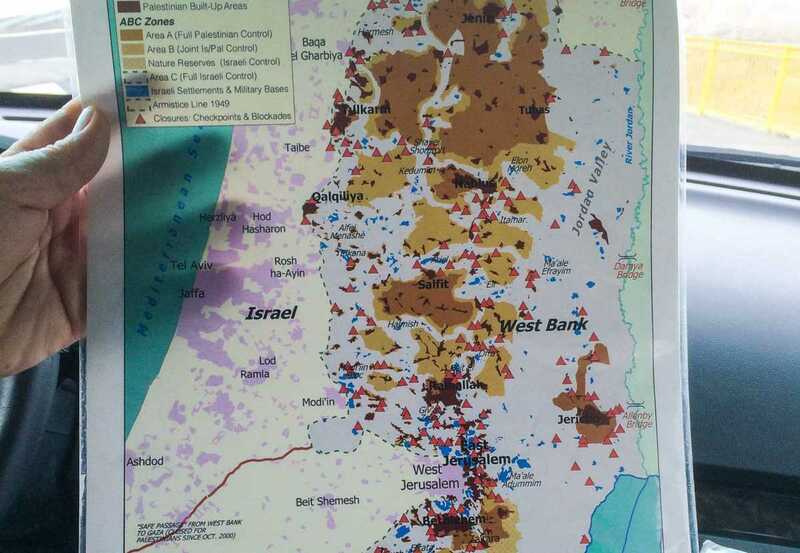 The story certainly drives home Israel’s current spirit of self-determination. The Dead Sea – Here is a chance to discuss ecology and water usage in Israel. The Dead Sea was replenished by the Jordan River which starts at the Sea of Galilee. But the Sea of Galilee is now a reservoir serving Israel. 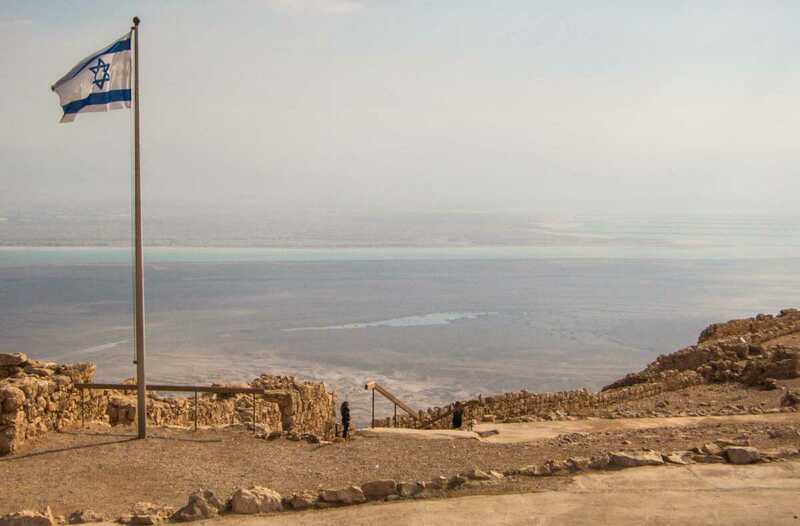 The combination of lack of rain and diversion or resources has critically affected water levels in the Dead Sea. 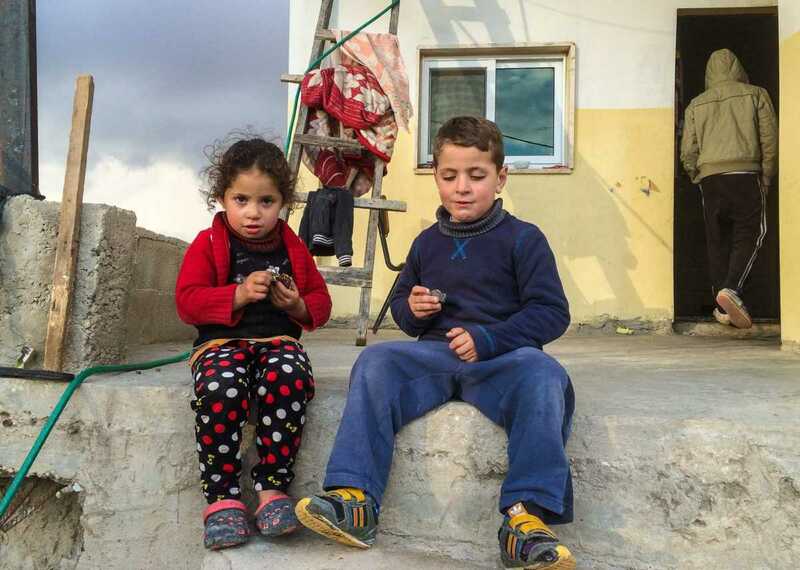 Palestinian village – We were invited to share bread and tea and hear the stories of one family and their neighbors. What stays with us, besides the lack of resources available to them, is the fact that their children can’t walk to school because of blocked ways and sporadic violence, but must take a long and circuitous route, under protection. Settlements – Where we could see first hand that these are not temporary enclaves but highly engineered exurban communities with all the 21st Century infrastructure. Eerily, they are approached through Israeli-only highways, like passing through a bubbled transit zone on your way home. There’s no pretending this tour offers an apolitical approach to the Israeli situation. Nor is Green Olive’s work necessarily changing the political landscape in Israel. Most of Green Olive’s five thousand annual guests are international visitors, not Israelis. But what visitors will note is the restriction of movement, and the disparate allocation of resources. “We do educate people, we offer our analysis which tends to be biased toward human rights and democratic values. In Israel, that’s considered to be a radical bias,” said Schlomka. Realistically, he added, things may get worse before they get better. A visitor can be forgiven confusion over which territory is controlled by whom. It tales a while to count the roadblocks and settlements. For his part, Schlomka looks to other regions of the world to study and share cross-cultural tours. Cyprus, for example, is a divided country of interest to him. Want to guess where else? The United States. Schlomka is scouting possibilities for a tour that will explore our political divisions ‘One Year After Trump.’ Will Americans show up, or will we leave it for the edification of our international guests? Besides the story of Green Olive, we wanted to hear more about Fred’s own travels and bike treks. He dd share this bit, which speaks to his nomadic state of mind: “I love the freedom of the road on a bicycle. Also now that the kids are grown, I can allow myself this freedom that I enjoyed in my youth. Spending several months a year on the road is perfect.” We identify with this! Regarding logistics, he advises travelers to pack light and have several map apps. When I left Hub Cycle on foot after our meeting, I spotted Fred wheeling around the block to try out his new custom-made ride. Days later, I was following him on Facebook as he cycled through southern Minnesota stopping off to visit family and posting long entries filled with observations from the trails and campgrounds. It was a piece of Americana, perhaps a view only possible from a world citizen’s perspective. Note: We were not hosted or in any way compensated for our Green Olive tour or this story. Fred and others produce a blog on the Green Olive site, or you can find him on Facebook. Green Olive Tours sounds great. Innovative itineraries are what makes a truly memorable trip. Even if it only caters to international visitors, it’s still important work. Too many people see the problems in Israel as easily solvable, if only both sides just wanted it enough. They don’t see how intricate the situation is, and how there are far more than two sides. Right you are, Rachel. We were grateful to get a closer look. In a day’s tour we learned a lot, but also began to comprehend how much deeper the issues go. I wish I knew about the Green Olive Collective tours when we visited Israel several years ago. We actually did some of our touring with a hostel group that had us swinging back and forth between Arab Israel and Jewish Israel, sometimes in the same city, for example, Nazareth. Fortunately, an Israeli physician did 2 years of research in my husband’s laboratory at the University of Pennsylvania. Our invitation to Israel was through him, so we had the chance to hear about things from an Israeli who in no uncertain terms did NOT vote for Bibi. When we visited him at Haddasah Hospital, the first person he introduced us to was an Israeli Arab surgeon. We also met some of my husband’s first cousins for the first time. They took us to Masada and the Dead Sea. Israel and that part of the Middle East is certainly a complex place. Maybe we should start “Red and Blue State Tours”. Fred Schmokla sounds like a fascinating (and maybe exhausting) guy. Thanks, Suzanne. I wonder if you’ve been back since? It’s always fascinating to speak with people who are in the center of the news we read (or the stories we hear from associates). Oh, and I wouldn’t be surprised if Fred starts a USA tour of the red & blue sort. It’s a topic that interests him, too. Green Olive Tours is quite a unique sounding company! I can see it would be quite educational to take one of his tours. I wish him well as he seeks to expand his offerings. Thanks, Debbra. Yes, it’s exciting to see what balanced tours can do for better understanding…and improved tourism. Have you ever heard of the Black Taxi tours in Belfast? Another great example of looking at history and issues from both sides. I applaud the concept and his efforts. So many places in the world being continually hurt by geopolitical ideologies. Highlighting the complexities of theses situations must be so very difficult. We could use a lot more Fred’s. Yes, and we hope he inspires more courageous tours around the world. Fred has touched upon the need for a deeper understanding of places in conflict. Israel/Palestine was a great place to start for his Green Olive Tours. Pakistan/India in the Kashmir is another. The US, too? It’s a great service for travelers who want this kind of understanding. Yes, agreed. I think it might be time to check back in with Fred and see what he’s up to.